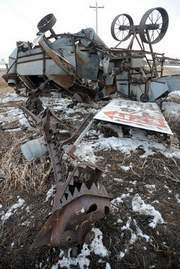 Such a bummer of a headline in the Coloradoan this morning: the Swetsville metal dinosaur sculpture that has stood watch over cars traveling I-25 for 20 years was crushed in an accident overnight. “Roar! Roar!” (said with clawing hand motions). I imagine this same conversation repeated over and over in any number of cars by any number of kids and parents. This simple moment will not be repeated again. One of the Swets family members was quoted in the paper saying that the dinosaur can’t be repaired. The other part of me is mad. The Swets have maintained the Swetsville Zoo on their property for decades. Open to the public for FREE, it’s a wonderland of fantasy and whimsy created from iron scraps. Bill Swets, the creator, was a farmer with imaginative eyes and able hands, an artist whose medium was metal. One of his creations, “Tiny,” had a home in Old Town Fort Collins before it became a much-loved fixture at the old Discovery Science Center on Prospect. When Discovery Science Center moved to the Fort Collins Museum building in the summer of 2009, Tiny returned home to the Swetsville Zoo. In recent years, some other sculptures have been moved and remaining parts of the zoo consolidated to make way for improvements to Harmony Road. Now comes this additional loss. Reportedly, the Swets family will be selling the farm at some point in the future. We will be losing this unique part of the artistic landscape of Fort Collins. We’ve already lost pieces of it to progress and reckless driving (the driver admitted to speeding). Happily, the town of Timnath has purchased some of the sculptures for their park areas but they can’t preserve the zoo as in its entirety as it is now. It’s a reminder to our community to appreciate what we have now – before, like “Dino,” it becomes just a memory. Have you ever wondered where that characteristic smell of the ocean comes from (somewhat harder to experience in Colorado, but trust me, it’s distinct)? Or what the White Cliffs of Dover are made out of? Or perhaps you’ve always been curious about what that crab you dipped in butter sauce last night for dinner looked like when it hatched out of its egg. 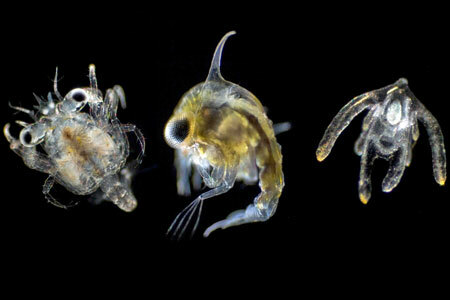 All those questions and more get answered in the most beautiful photographs of plankton I’ve ever seen. The photographs are on exhibit at the London Zoo to commemorate the 350th anniversary of The Royal Society, but if you can’t hop the pond to England, have no fear. The BBC has a slide show of the photos, plus a fascinating narration by the photographer, Dr. Richard Kirby. Enjoy! P.S. 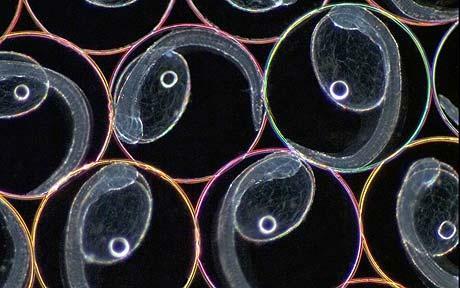 How cool is the photograph of the starfish juvenile developing on the starfish larva starting at 4:43 on the slide show? I’ve been having a great time roaming the results website for this year’s Great Backyard Bird Count. If you have a chance, check it out at www.birdcount.org. I’m very proud of Fort Collins: we increased our total number of checklists submitted this year. Now, I confess that our checklist total only went up by two (80 in 2009, 82 in 2010), but it was enough to rank us #2 in cities in Colorado submitting lists (Colorado Springs turned in a whopping 158 lists). The good new is that lists can be submitted until March 1. I know for a fact that our number will go up because I still need to enter my count from Monday, February 15. In a disappointment, the Red-shouldered Hawk that’s been spotted west of Windsor did not show up on anyone’s list. 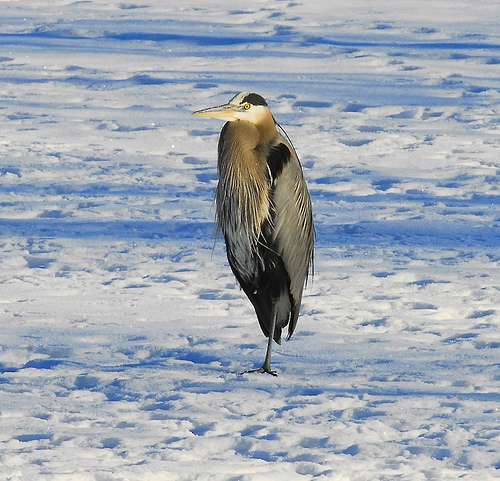 However, someone did spot a Great Blue Heron (I’ve seen them here in January in past years, so it’s good to know someone got one documented with the GBBC). Someone else saw a pygmy nuthatch. This is a cute little, social bird that can walk down tree trunks headfirst! Fort Collins is a little east of its normal range, so it’s neat that someone captured its presence here in a checklist. Next year, I think we need to aim to break 100 checklists submitted from Fort Collins. Anyone else on board for that goal? 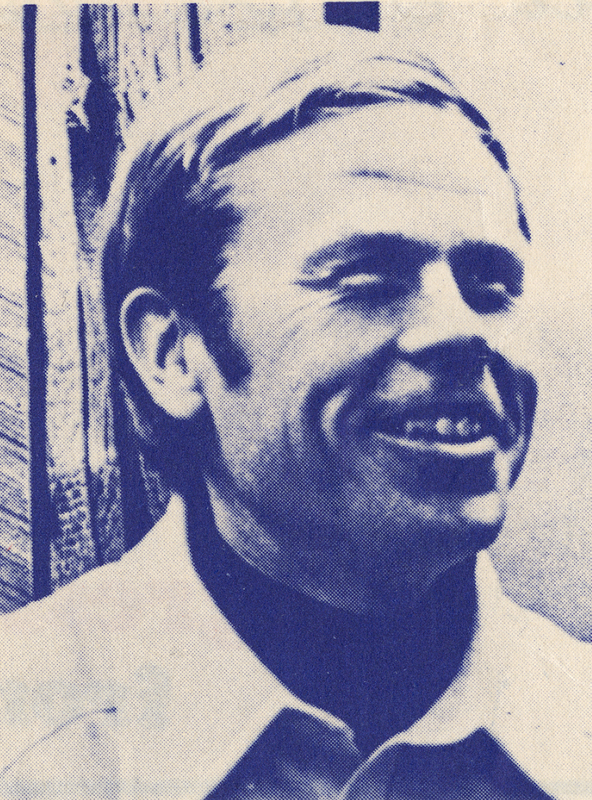 Fort Collins had a personal share of Olympic glory in the 1960s and 70s when local resident Peter J. Lahdenpera competed in the first Olympic biathlon, a combination of cross-country skiing and rifle marksmanship, which debuted during the 1960 Winter Games in Squaw Valley, California. He was also on the U.S. Nordic team, and went on to be a member of both U.S. Biathlon and Nordic teams during the Winter Olympics in 1964 in Innsbruck, Austria and the 1972 games in Sapporo, Japan. Born in Finland, Peter came to the United States at age 13. 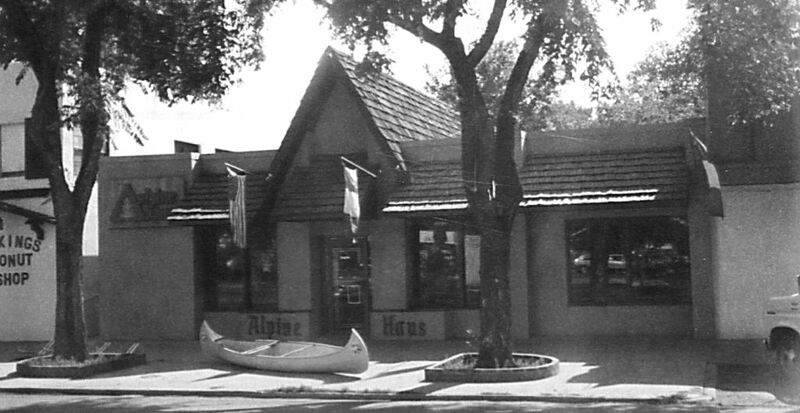 He moved to Fort Collins in 1961 and owned the Alpine Haus, a ski and sports shop once located at 628 South College Avenue. Business was so brisk at the Alpine Haus that Lahdenpera was prevented from trying out in the 1968 Olympics held in Grenoble, France. Perhaps Fort Collins customers were hoping some of Peter’s Olympic charm would carry over to their ski purchases? Peter went on to serve as team leader for the U.S. Biathlon squad for several years, including the 1976 Winter Olympics held once again in Innsbruck. You can view Peter’s official Olympics results here. 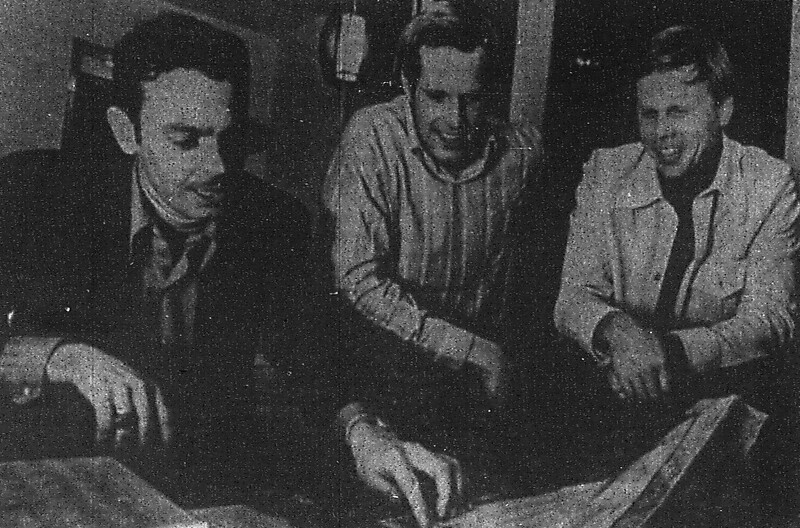 From left to right: 1st Lt. Dexter Morse of Aspen (member of the Biathlon team), Olympic Ski Coach James Shea, and Peter Lahdenpera look through clippings from 1964 Olympic Games in this photo from 1972. In a study released on Tuesday, February 16th, researchers reveal the results of their “molecular Egpytology” – an analysis of DNA extracted from the bones of 11 Egyptian mummies, including King Tutankhamen. King Tutankhamen (“Tut,” for short), ruled Egypt from 1333 B.C. to 1324 B.C as part of the 18th Dynasty. He became King when he was only nine, and ruled for approximately ten years. Tutankhamen is arguably the best-known of the Egyptian pharaohs, largely because his tomb was one of the few not vandalized by grave robbers before being excavated in 1922 by archaeologist Howard Carter. 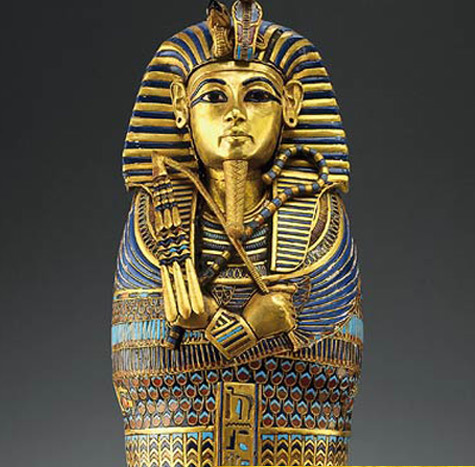 Artifacts from his tomb have been exhibited all over the world. While Tutankhamen may be the best-known pharaoh, there’s still a lot about him that remains unknown. One of the biggest questions has always been: how did he die? Several theories have been proposed over the years, including skull trauma, a gangrene infection, and even murder. The molecular findings released yesterday point to a combination of malaria and avascular bone necrosis, a condition in which areas of bone are weakened because they don’t get enough blood, as the cause of Tutankhamen’s death. In addition, the DNA analysis challenges a theory about the Egyptian royal family’s appearance. Wall paintings and statues of royals from the 18th Dynasty depict Tutankhamen and his relatives with often feminized or androgynous appearances. This lead scientists to suspect that genetic abnormalities such as Marfan syndrome were common within the heavily inbred family. However, the latest research shows no evidence of syndromes that would cause those physical appearances. It’s seems more likely that the members of the Egyptian royal family were simply having themselves portrayed in an idealized fashion.